Pour la version française de ce courriel, cliquez ici. you can unsubscribe from our mailing list by clicking "Unsubscribe" above. If you would like to change the language in which you receive our emails, please click "Update Your Email Preferences" above. 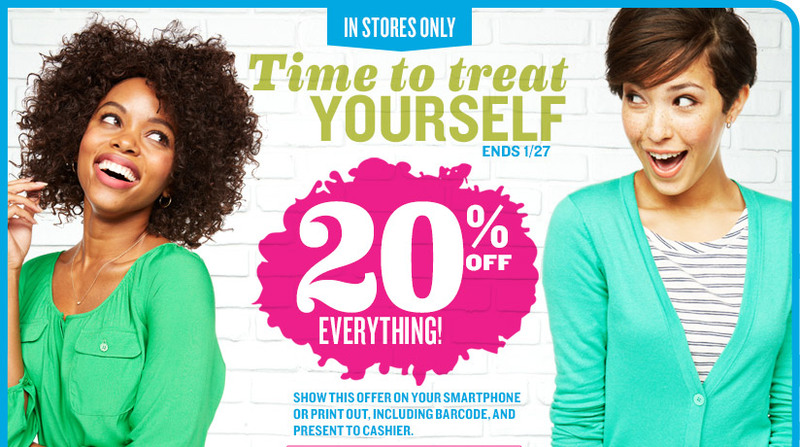 20% Off: Offer valid on Old Navy merchandise only from 1/24/13 at 12:01 am ET through 1/27/13 at 11:59 pm ET in Canada at Old Navy stores only. Not valid at oldnavy.ca. Not valid on international purchases. Qualifying amount applies to merchandise only, not value of gift cards purchased, packaging, applicable taxes or shipping & handling charges. Code is limited to one-time use only. No adjustments on previous purchases. Not valid for cash or cash equivalent. Cannot be combined with other offers or discounts, including Gap Inc. employee discount.